The printed bacteria from the toilet biofilm viewed under UV light and revealing their glowing message. Here’s some BioArt that I carried out at home using DIY Bio. Anyone could do this. I found a bacterial biofilm growing under the rim of the toilet in our en suite bathroom (I suspect that even the cleanest of toilets will have these). Using General Kitchen Agar (GKA), a bacteriological medium that can be made at home and with ingredients that can be purchased at any supermarket, I cultured the bacteria from the biofilm. 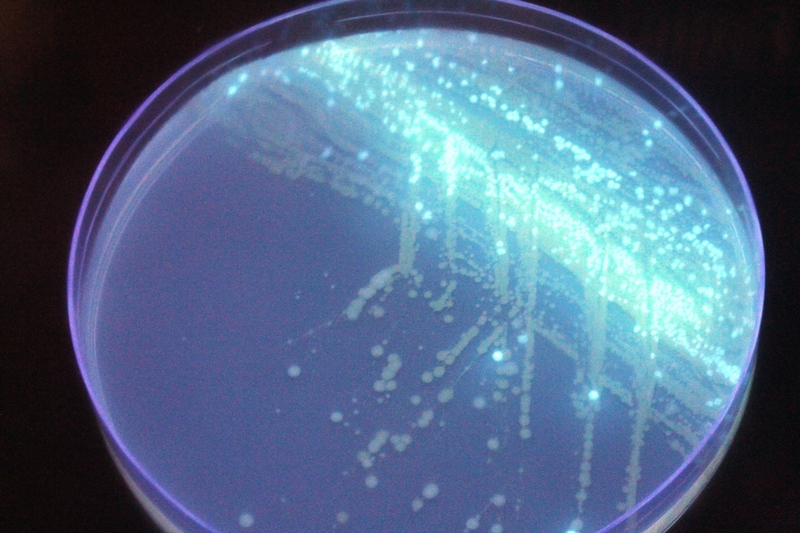 When the bacteria are visualized under a UV/Blacklight (again readily available) they can be seen to be highly fluorescent (the ones that appear to glow blue) and because of this are probably Pseudomonas species. I purchased a bespoke rubber stamp, used these bacteria as a living ink, so that when exposed to UV light they reveal a pertinent message! Am I concerned with this apparent lapse of home hygiene? Not at all, it’s just another striking example of the ability of bacteria to adapt to the new environments that we seem to perpetually, and unintentionally, create for them. Who says there is no value in playing has not seen your exploits.